My wife and I absolutely love us some poke. When we were in Hawaii, she ate poke almost every single day, from just about anywhere she could find it. She was on a mission to find the best so that we could replicate it when we returned home. Mission accomplished. 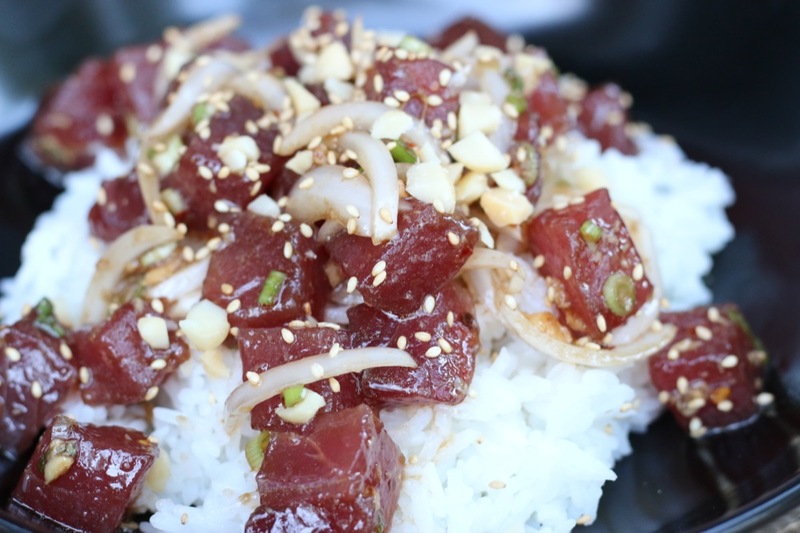 As a matter of fact, I think I can be so bold as to say this poke recipe rivals that of Tanioka’s on Oahu, said to be the best poke in Hawaii (and it was the best we had while we were there). 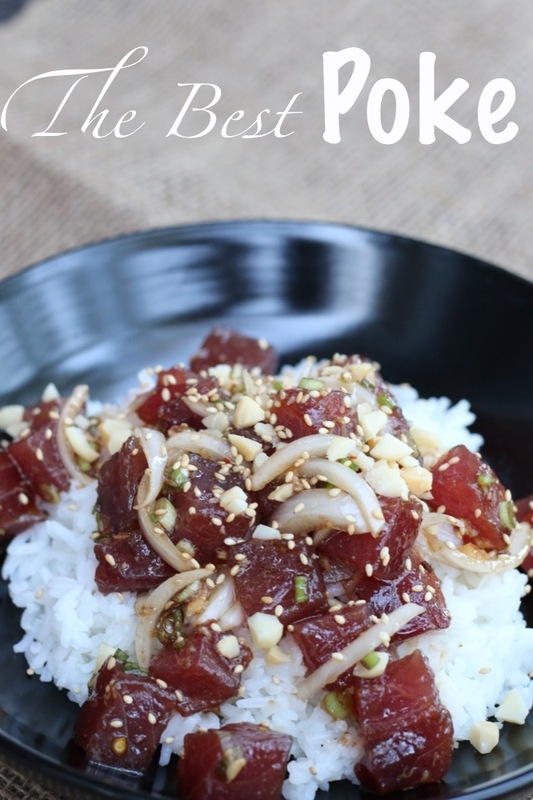 Follow the recipe at the bottom for a delicious poke that will beat any competitor in an underground, back alley sumo match. It is so good that I can say that the smart money is on this recipe. Haven’t ever tried poke? Now is the time to start. But be warned, you might not ever find another poke as good as this, so you will have very high expectations moving forward. And just to be clear, it is pronounced po-kay. It isn’t a dead body that you POKE with a stick, it is po-kay. Just wanted to get that out of my system before we move on. 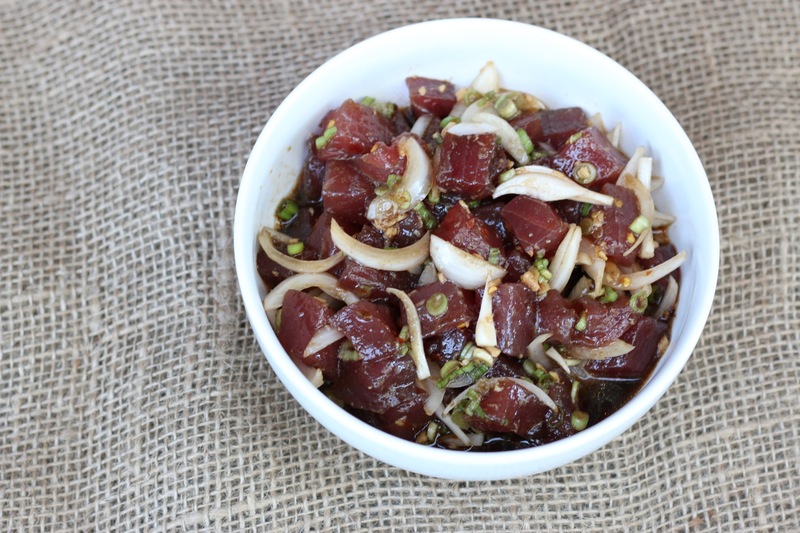 The key to great poke is finding high quality sashimi grade Ahi. We are lucky on the central coast of California to have access to amazing quality fish. 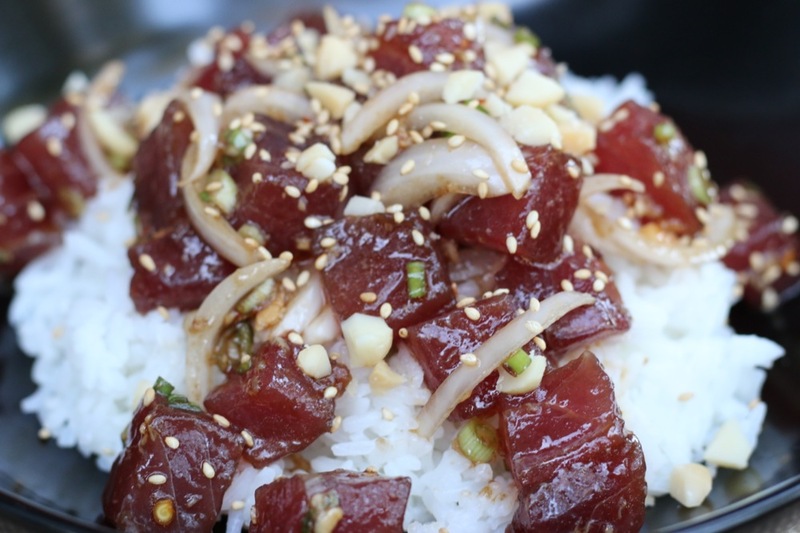 Do not attempt to make this if you cannot get sashimi grade Ahi. You will regret it, and possibly even worse, you could get sick. We are very diligent about only buying fish from reputable purveyors who can tell us exactly where the fish was sourced. We do not buy fish from the grocery store. That being said, I realize that not everyone has this luxury, so please just be mindful of what you are buying, especially when it comes to consuming raw fish. In a medium size bowl, combine shoyu soy sauce, sesame oil, ginger, garlic, and chili oil (if using). Stir a bit to mix it. Julienne onions, chop green onions and chop macadamia nuts and set aside. 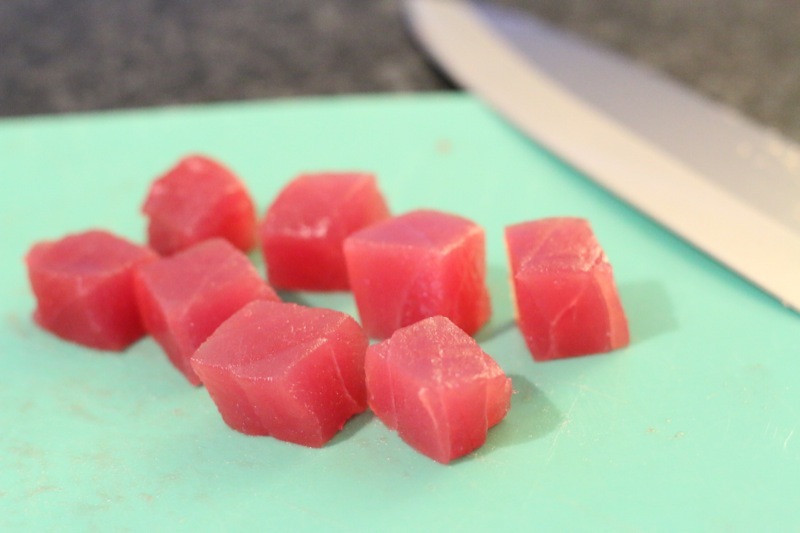 Cut the ahi steak into approximately 1/2″ cubes. Put the cubed ahi into the sauce mixture and stir to combine. Add onions, both sweet and green, and macadamia nuts and stir everything well to make sure the sauce has coated all the ingredients. Cover the bowl with plastic wrap and put in the refrigerator for a minimum of 30 minutes and up to 4 hours before serving. Prepare rice according to packaging. I like to allow the rice to cool 30 minutes before plating so that the rice doesn’t heat the ahi too much. 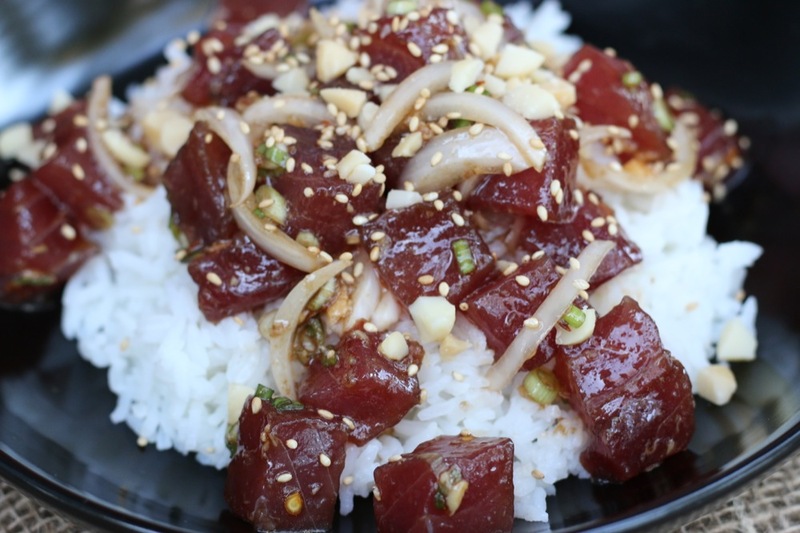 You want the ahi to be nice and cold and the rice to be slightly warm. To plate, divide the rice evenly between two bowls. Top the rice with the poke, dividing evenly. Garnish with sesame seeds, if desired. Please let me know what you think! If you love it, share it! We worked hard on this one – lots of trial runs….